At the cliff, spot the huge left-facing corner of Easy Verschneidung (Easy V) on the right; scramble up on ledges about 20' left of Easy V to start. P1: Follow face and crack systems up and slightly left to a bolted belay at the ledge system under a roof. A bit runout towards the top. 5.6, 100'. P2: Angle left through the notch in the roof. After a few hard tugs, you will be below a beautiful white slab. 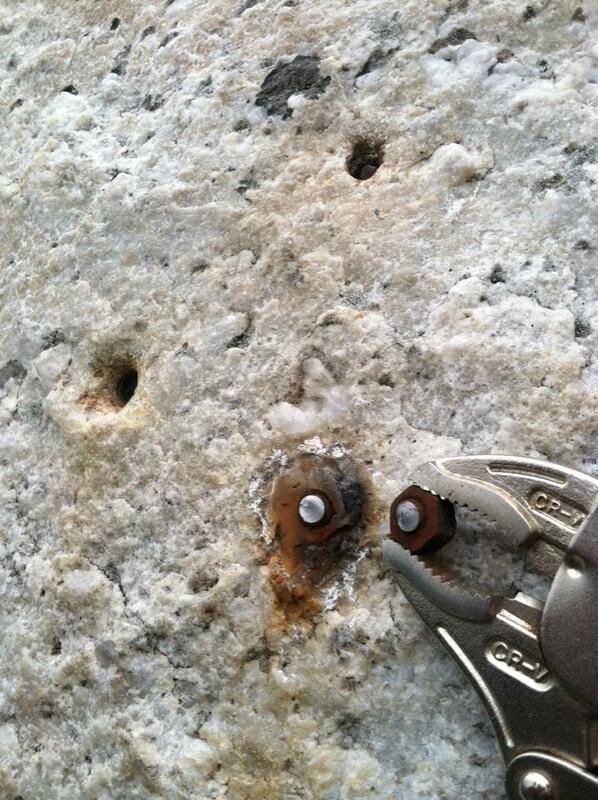 Follow this slab, passing 2 bolts on the way to a final headwall. The crux reach is protected by a final bolt. 5.8, 100'. Bolts on this pitch were replaced in 2015 (see comment). Rap twice with a single 60M rope from bolt anchors at the GT ledge and mid-cliff ledge. Climber debating the crux moves on Arrow. It was her first pitch ever. Dede reaching for the key crimp at the crux on P2. Setting up for the crux move . . .
. . . and committing to the move. At the top of Arrow. PW putting the finishing touches on "Arrow". When I led it, I went right; if I recall correctly, I found a small sidepull to the right and rocked up on that to reach the ledge. Since I haven't made the move to the left that Guy describes, I can't say which is harder. Afterward, I did ask Richard Goldstone (my partner for the day) if I'd been off route by going right. He told me he and some other long-time Gunks climbers got on Arrow one day to see how many different ways there were to make the crux move; they came up with 26. Heh! Left of the bolt gives you the full 5.8 grade. Right of the bolt is a bit easier. Left of the bolt is where the original route went. I've climbed that a few different ways. I think they are all 5.9, and no one would even think twice about calling them 5.9 if the bolt was ten feet below the move rather than in top-rope position. But the difficulty really does boil down to a single move. This is one of many examples of the persistence of historical grading at the Gunks---the Arrow started out at 5.8 and that's where it stayed. Art Gran, in the first Gunks guide, seemed to have a bit of a thing about assigning high grades to routes done by climbers he didn't think were "good enough" to climb at that level; grading by climber rather than by intrinsic difficulty. The most famous example of this is a short, poorly protected lead called Jacob's Ladder (led by Phil Jacobus way back in the day; you could probably count the onsight leads in the intervening fifty years on one hand). Gran fell off on a top rope but still rated it 5.8 because that was his judgment of Phil's "ability." Enough good climbers fell off on top-ropes that that particular historical grade did not persist; the route is now understood to be 5.10. Gran seemed to have it in for Willy Crowther, who made the first ascent of the Arrow, so 5.8 it was, and 5.8 it remains. With a top rope from the bolt, it really doesn't matter too much what the rating is. Both of my seconds opted for right of the bolt after much consternation. I went to the left and didn't feel like it was too bad. Note to 6-footers and up, you can reach the key crimp from the rest where you clip the bolt, though it'll be a stretch. Once you've found a comfortable hold for your right foot, it's not too much of a problem to move up to the jug above. Just onsighted this as my first 5.8 lead yesterday...very exciting. My partner belayed p2 from the rap anchors on the right side of the ledge...this is a nice location if you clip to the top ring of the anchor, since you can nestle into the shade under the roof and you're not in the way of anyone coming down...however you're pretty much out of sight/earshot of the leader. If you start up the corner right of the notch there's no good pro, but if you then step left about 4' there's a left-facing flake at eye level that takes a 00 cam nicely...just enough to get you under the notch. Turned out the bolts were rotten, presumably caused by galvanic corrosion in a mixed-metal bolt and hanger combination. Today Christian Fracchia of the Gunks Climbers' Coalition replaced them. Video of rotted bolts on Facebook. So happy this was my first 5.8 lead! There are a couple thin options for pro moving off the GT ledge and through the roof. Protect what you can, it's better than nothing. And there's not much you can (or need to) protect when cruising the lovely slab anyway until you reach the bolts. I placed some pro wherever I could moving through the overhang...there was an okay spot for my 0.3 X4 just below the V notch. Then maybe one cam between the overhang and the bolts. Lol.